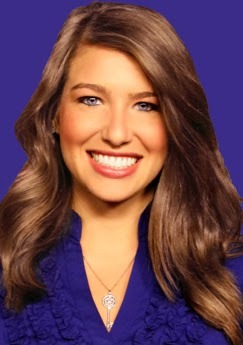 KATV/Channel 7/Little Rock anchor Christina Munoz is leaving the station. Arkansas Times reports Munoz will become the associate vice president for communications, public relations and marketing at UCA. 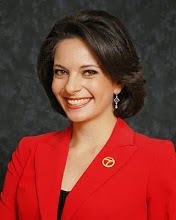 Munoz joined KATV in 2003. Former KHBS/KHOG/40/29 sportscaster Mike Jocko Jacques has a new job. He made the announcement on his facebook page today. Jacques' last day at 40/29 was February 14th. KTHV/Channel 11/Little Rock has launched its new web design. 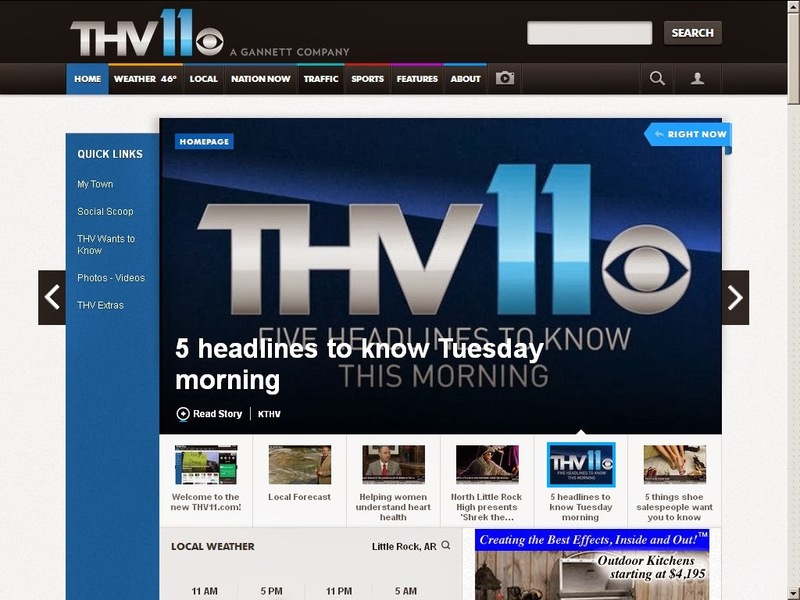 THV11.com's design is used by many of the Gannett Broadcasting stations and properties. Fox16 will launch a new weekly Sunday night sports show hosted by Sports Director Wess Moore. 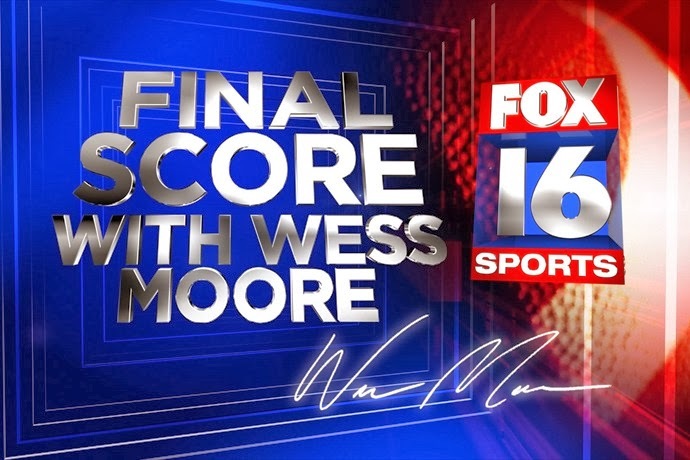 "Final Score with Wess Moore" will air Sundays at 10 p.m. immediately following Fox16 News at 9 p.m. The new broadcast continues Fox16's expansion of local sports coverage that began this past fall with "Fearless Friday" and "Fearless Friday: Statewide Edition" during the high school football season. "Final Score with Wess Moore" aired periodically following Arkansas Razorback football games. After receiving excellent feedback from viewers, it was clear Central Arkansas is hungry for additional local sports coverage. The broadcast will feature top highlights from the previous week along with a look ahead to what's scheduled for the next few days. The show will also feature the biggest names in Arkansas sports as on-set guests -- plus, Wess Moore's popular commentary segment "One More Thought." The show is also a place for you to have your say in what's covered and discussed. KATV will be launching “Talk Business & Politics” with Roby Brock Sunday, March 2nd. 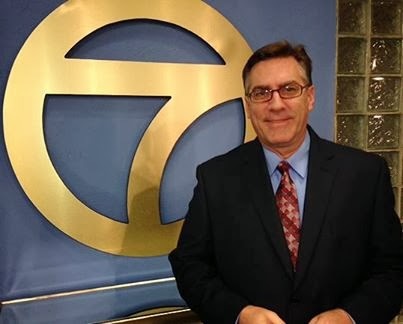 Channel 7 President and General Manager Mark Rose is excited to announce that “Talk Business & Politics” with Roby Brock will debut on KATV Channel 7 Sunday, March 2, 2014. Brock who has been a fixture on Arkansas television for 15 years and has established himself as the leading source for local business and political news. His new show will be seen at 9 a.m. on Sunday mornings following ABC’s “This Week,” and will also feature Channel 7 News Anchor Scott Inman and Lead Capitol Reporter Janelle Lilley. Talk Business & Politics will also partner with KATV’s award-winning news team to create more business and political content, and it will feature executive editor Roby Brock as a commentator and analyst in newscasts regularly. 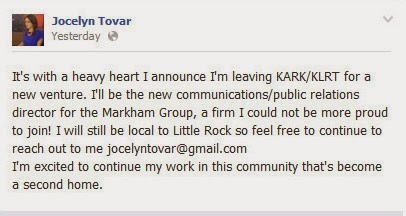 KARK/Channel 4/Little Rock reporter Jocelyn Tovar has announced she is leaving the station. She posted on her facebook page she will be going to work at for the Markham Group. KATV/Channel 7/Little Rock is touting the success of a viewer testimonial ad campaign for the up swing in viewers for its morning show. Daybreak has climbed to a 31 share according to the November ratings book. That is up from an 18 share in May 2011. In that time frame KATV stole Alyson Courtney from KTHV. 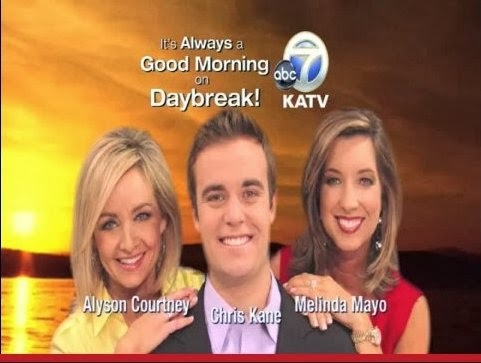 In 2011 KATV started a viewer testimonial campaign featuring viewers of the popular morning show. According to an article on TV News Check.com, two producers were also hired for Daybreak. Rob Thomas, KATV’s creative services director told TV News Check, “I have no idea whether growth like that has happened anywhere so quickly,” Thomas says, “maybe it has, but it’s rare. We’ve had extraordinary success in turning around the numbers. Four ratings periods since the changes — November 2011, May 2012, February 2013 and November 2013 — we’ve had clean sweeps in households and demos in the mornings. It had been more than a decade since the station had that kind of success. Testimonials can be very effective if done correctly and consistently. The most important element: people who are passionate about your product,” Thomas claims. Tracey Rogers has been named the new general manager of Raycom Media's NBC affiliate WMC-TV channel 5 in Memphis, TN. Rogers previously worked as the GM of Raycom's ABC affiliate in Jonesboro, AR. Grossman and Alyssa Raymond have been hired. Both reporters come from the defunct TV 3 in Winchester, VA. TV Spy reports Grossman started Monday and Raymond will begin Monday. KHBS/KHOG 40/29 sports director Mike "Jocko" Jacques tipped viewers this week he is leaving the station. Apparently, Friday is his last day. No word on air yet as to where he is headed. Jacques joined the stations in June 2011. 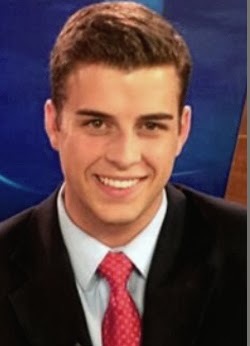 Previously, he was sports director in Wausau, Wisconsin, at WSAW-TV. He knew Arkansas' new football coach before he arrived from Wisconsin to take over the Razorbacks. 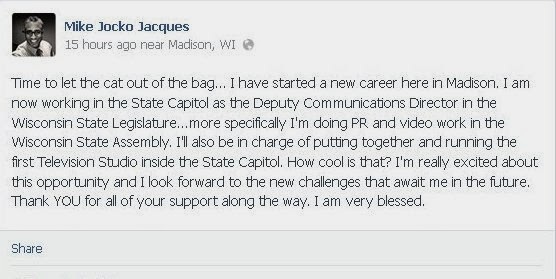 Jacques has also reported and produced sports for WMTV-TV in Madison and WISN-TV in Milwaukee. REALLY!! Yeppers, we ain't kiddin'.KATV/Channel 7/Little Rock met Todd Yakoubian is sorry he got the forecast wrong. 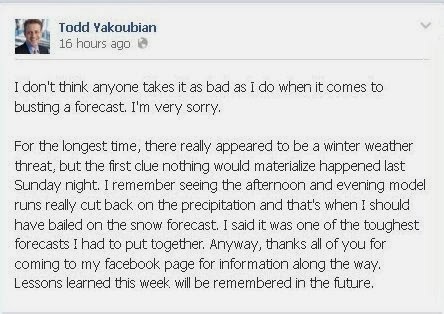 He took to facebook and his weather blog to apologize. I wonder if he offered his resignation. They have been popping up all over the country and yes it happened right here in Arkansas. 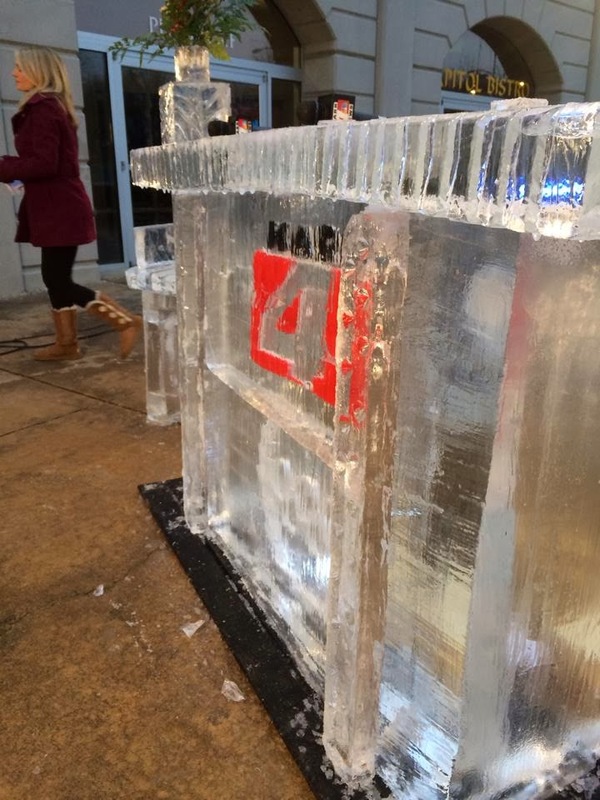 KARK/Channel 4/Little Rock had..well its still standing... so has..an ice anchor desk. Complete numbers can be found HERE. Something That Just Made Me Say...REALLY!! 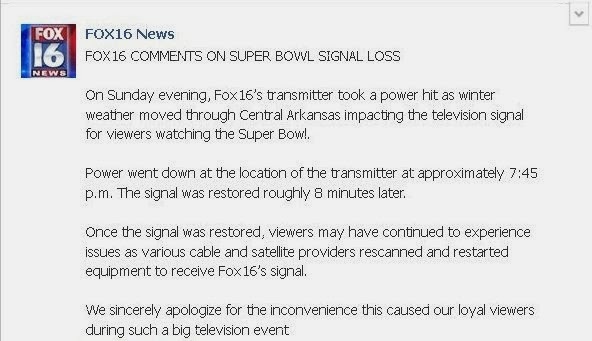 I am quite surprise to see Arkansas Today still simulcasted on the out of state Nexstar stations. I am at home today and actually wanted to watch some noon news so I turned to KTAL..but forgot Arkansas Today was being broadcast on the channel. Remember when the simulcast started, Nexstar said the program would feature and use resources from the other Nexstar channels it was being broadcast on. All you see is Arkansas news and weather. Like I said when it first started, I am not sure why Nexstar doesn't want to use the resources it has at its stations that the program is being broadcast on. OR why not just let the different stations do their own noon news! Just makes sense...and who knows would make more cents Nexstar!